5 Tips on How to Eat for a Healthy Immune System + Immune Booster Salad Recipe | eat purely. live purely. 2. Eat antioxidant rich foods. Look for foods rich in Vitamin C, Vitamin E, Zinc, Selenium and Beta-carotene. 3. Increase omega 3 fatty acids in the diet (in the form of chia seeds, hemp seeds, salmon or supplements). 4. Eat “good bacteria”. Fermented foods such as miso, tempeh, sauerkraut, kombucha, kimchi and cultured veggie contain healthy bacterias, which help to ease digestion, enhance immunity and decrease inflammation in the body. In addition, fermented foods provide enzymes that help to better absorb minerals, vitamins and nutrients. 5. Drink plenty of water. Add fresh lemon juice to flavor your water. Lemons are high in Vitamin C! 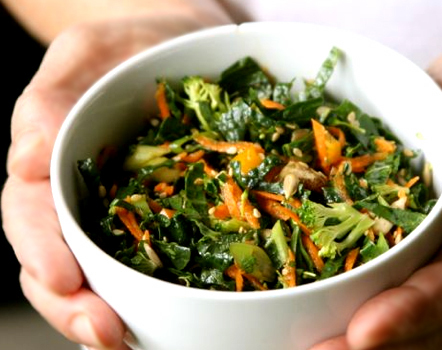 In a large mixing bowl, combine the kale, broccoli, carrots, bell pepper, scallions, parsley, sunflower seeds, sesame seeds, and dates. In a small bowl, whisk together the lemon juice, olive oil, coconut palm sugar, and ginger to combine. Let salad stand at room temperature for at least 15 minutes before serving. Recipe by Alissa Robertson, Registered Dietician and owner of Lifestyle Management & Nutrition. know that I found you through Google. Awesome. Good to know! Were you searching for something? Thank you! We do believe strongly here that clean eating is vital to health and that a diet filled with nutrient-rich foods can help heal your body. Thank you! Glad that you found this article helpful! Sorry to hear that, that sounds awful! We actually use WordPress and haven’t had any problems with it yet (knock on wood). I’m not too familiar with any other good platforms. I would look on Mashable.com, they are usually a really reliable source and may have reviews of blogger platforms. Let us know if you find anything good! I desire to counsel you few attention-grabbing things or tips. Hi Rubye, you’re right, it is time to be happy! Glad you found this article useful, we will absolutely post similar articles in the future, keep checking in! Can I substitute anything else for the palm sugar and still get the same results? I love how you did this and it is a colorful and beautiful salad as well as good for you. Coconut palm sugar is a one to one substitute for white sugar. We prefer the palm sugar because it’s unrefined, nutrient-rich and low glycemic. Wow, thanks for telling me. I didn’t know that. You see, in being a writer/editor/photographer every day is a learning experience. The more people I run into who are like minded like you, I learn from each and then it becomes a one on one sharing experience. No problem Paulette, it’s a learning experience for us too. That’s the fun part! We would love to post a recipe on your site! Thank you for the offer. That would be wonderful Elizabeth, and it is great meeting you!